After some high-altitude teasing from his teammates, James Posey elevated his game on his birthday, no less. Posey recorded his first career double-double with 13 points and a career-high 19 rebounds to help offset a relatively poor night from Antonio McDyess as the Denver Nuggets beat the Sacramento Kings 106-93 Friday. While flying home from a recent two-game road trip, McDyess and other Denver players ribbed Posey about failing to reach 10 rebounds. Posey, in his second season, had reached nine rebounds six times previously. "This was a night I felt I could get every rebound," said Posey, who turned 24 Friday. "I had been stuck on nine. I started early and tried to get every rebound possible." The im-Posing performance was part of a balanced Denver attack as the Nuggets had six players in double figures. Nick Van Exel led the way with 25 points, including 13 in the fourth quarter. "You saw Nick turn it on," Sacramento forward Chris Webber said. "He's been a King-killer for a long time and he didn't stop tonight." McDyess struggled through a 6-for-21 shooting night in an anticipated matchup against Webber, but he still managed 15 points and 12 rebounds for his 11th straight double-double. 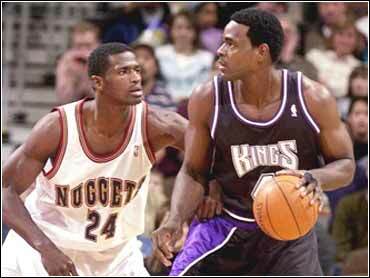 Webber led the Kings with 24 points and 14 rebounds but lamented the inability to contain Posey, a 6-foot-8 swingman. "Their small guys rebounded well," Webber said. "I know it was Posey's birthday, but how many did he have? Nineteen?" Playing shorthanded after a six-layer trade with Toronto just hours earlier, the Nuggets took an 11-point lead early in the fourth quarter before the Kings pulled to 84-81 with 7:57 remaining. Posey turned the momentum when he stole a pass from Jon Barry to thwart a 3-on-1 fastbreak, and McDyess dunked a miss by Van Exel to give Denver an 88-81 lead with 6:26 left. The Nuggets, who have won 11 of 14, outrebounded Sacramento 58-45. "The boards killed us. That and quick shots," Kings coach Rick Adelman said. "We worked hard defensively but gave up second opportunities. There was no way we were going to win that game." Sacramento, held under 100 points for just the ninth time in 33 games, never got closer than five points in the final five minutes as Van Exel and George McCloud helped put the game away with back-to-back 3-pointers in the waning minutes. "We were able to win a basketball game when Antonio struggled shooting the ball," Denver coach Dan Issel said. "We were able to do that for a number of reasons, not the least of which was the great game that Posey played." Facing Webber for the first time this season, McDyess missed several short shots and admitted to letting the trade affect his play. "It had nothing to do with Webber or anything," he said. "When I came in here and found out about the trade and about Keon (Clark), that was on my mind more than anything. I took it to the court, which I shouldn't have done." Denver sent Clark, Tracy Murray and Mamadou N'diaye to Toronto on Friday for Kevin Willis, Aleksandar Radojevic, Garth Joseph and a draft pick. Webber seemed content to stay outside against the Nuggets, scoring just eight points inside the paint. He was the only Kings player who had consistent success from the perimeter as Sacramento finished 5-for-22 from 3-point range. Denver was 10-for-26 from beyond the arc. Voshon Lenard, who had 22 points, scored eight points in the final four minutes of the third quarter, including a 3-pointer with three seconds left to give the Nuggets a 78-71 lead heading to the fourth. The shot clock was a non-factor in the first half as both teams pushed the pace. The Nuggets got 14 points from Raef LaFrentz and 13 rebounds from Posey in the first 24 minutes but trailed 53-51 at halftime. The Nuggets placed G Calbert Cheaney on the injured list with a strained left hamstring. McCloud returned to the team after missing two games because of a family emergency. LaFrentz grabbed his 1,000th career rebound. After seven straight home games, Sacramento began a stretch of five of six on the road. Webber and McDyess are two of five players averaging at least 20 points and 10 rebounds.